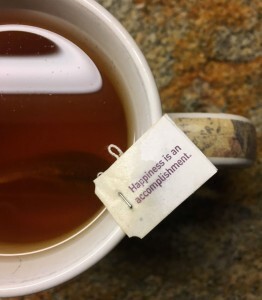 My favorite Yogi tea (Vanilla Spice – Perfect Energy) had this message for me recently: Happiness is an accomplishment. This led me to ponder this elusive state called happiness that we are all continuously seeking in some way. I’ve been trying to just “be happy” for most of my adult life. What job would make me happy? What material item can? How much more money do I need to find happiness? Here are a few things that I have picked up over time about happiness. Happiness is a temporary state. We can never reach the final destination of happiness and stay there (unless, I guess, we cease to exist). It’s temporary. I always thought that if I did the right things, then I would be happy. And my husband has often said, “I just want you to be happy,” as though it were something I could turn on and keep on. Happiness doesn’t work that way. It isn’t permanent; each moment can be a happy one, or not. The good old Dalai Lama says, “Happiness is not something ready made. It comes from your own actions,” and I believe this to be true. We cannot depend on others for it, nor can we expect it to last forever. It’s up to us to create it, regardless of what is happening around us. Happiness is a practice. The first statement about the impermanence of happiness leads me to the second – that happiness is truly a practice. It’s not something we arrive at; it’s work – all the time, every day. And that’s okay. If we can add up all those little things that make us happy (for me some are: a hot shower, sleeping in, good coffee, having nothing to do), then we will find these little moments of joy. And if we multiply them, then we might just find that we are, well, happy, for now anyway. The Dalai Lama’s buddy, the Buddha, says “There is no path to happiness. Happiness is the path.” That might be a little tougher to swallow, and understand, but my interpretation is that we won’t find the place that l eads to happiness, we must practice it all the time. We do that by knowing that we won’t ever stumble upon happiness and stay there. We won’t reach that point where, finally, we’re happy (though part of me still wants to believe that). 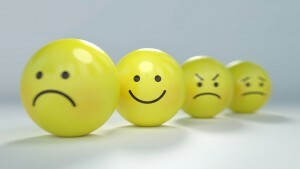 We will have some good moments where we feel it, then some that are really far from it too. So, if my Yogi tea bag is correct, then happiness is an accomplishment, but one that we can’t hold onto forever. As Thanksgiving is a day away and we are all supposed to be happy with this holiday of gratitude and surrounding ourselves with family, maybe we just try enjoying those little things instead: the gravy that came out right, the weather, or relishing a day of food and rest because it’s a small break before Christmas looms upon us. And we can use the words of Ellen DeGeneres for that day, and others: “Do things that you make you happy, within the confines of the legal system.” Sage-like advice. Why Would You Cleanse – Again? Previous: 4 Tips for New Moms – and Experienced Ones Too! Jeni on Why Would You Cleanse – Again? Karen Rollins on Why Would You Cleanse – Again?